I never really used to do much meal planning. I'd buy a bunch of groceries at the store each week. We'd decide the night before what we would be eating for dinner the next night and take out the foods we needed from the freezer; occasionally heading back to the store to pick up an occasional ingredient or two or changing up what we had planned to make. For the whole first year we homeschooled I kept up with our normal routine. However, I used to grocery shop when the boys were in school and taking all three boys to the grocery store every week was not fun. It was also difficult to find time to get to the store each week with all of our schoolwork, activities, field trips, and events. 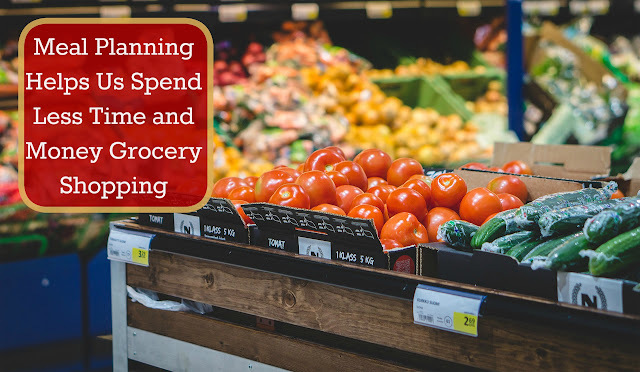 Much like how I keep up with the laundry and how I find time to do all the housework, we needed an overhaul of our grocery and meal planning techniques! I started reading blog after blog about grocery shopping once a month with a full menu planned for family breakfast, lunches, dinners and snacks and while that idea appealed to me it sounded like a lot of work and I really didn't think we'd have enough room to store food for our family for a month at a time. We experimented and played around with a few different systems-- we tried going grocery shopping at night with the whole family. It helped having my husband around and we could split up covering more of the store in a shorter time but then we bought more impulse buys and more food then we really needed. We tried stretching out grocery trips to every week and half but found that we were often left with very little food by the time we went shopping so we would end up over buying and then throwing away food before we had a chance to eat it as it started to spoil. I decided it was time to start meal planning. Meal planning has helped us cut down our grocery trips to just once every two weeks. It has cut down on missing ingredients and last minute trips to the store. Meal planning helps cut down on the complaints at dinnertime. Meal planning has stopped from everyone asking "what's for dinner?" It helps me have dinner on the table at a reasonable time. It saves me so much time! My boys are in charge of their own breakfast and lunches and since my husband often takes leftover for his lunch we decided, for us, meal planning only made sense for dinner time. We'd make sure to have a variety of quick, easy to prepare foods around for breakfast and lunch and keep a rotating variety on hand but we don't plan out those meals. I could have easily written up the meal planning on my own but really wanted the whole families input so that everyone would get an equal say in what we were eating. I printed out a blank monthly planning sheet and wrote in what nights we knew we would not be home for dinner or already had something planned for meals that day. Once every few weeks I sit down at dinner with the whole family and we each take turns picking a meal or two we'd like to see on the menu. My husband and I fill in any blank spots with recipes that would use up leftovers from previous meals or with menu items that use up those ingredients we already have in the house. This assures we have a good variety of meals and gives me a starting point for writing up our grocery list. 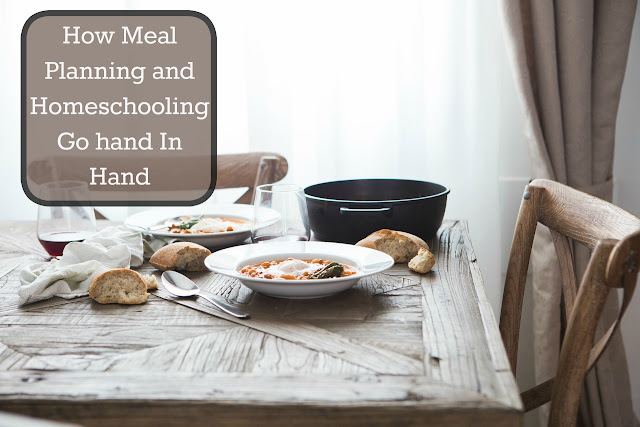 I've also found that including the boys in meal planning has helped in two ways. I know now what meal to have each boy help me prepare each week! Once the menu is made I go through all the cabinets, fridge, and freezer to double check and see what we need to buy. Making sure to fully think through each and every ingredient I need for each meal. Then I write up my list roughly following the layout of the grocery store aisles. We go shopping once every two weeks and we have found that this works really well for us. I don't adhere strictly to our menu list but use them as a guide for two weeks worth of meals I have all the ingredients for in our home. For example: I might rearrange a few days of the meal planning to make sure all meals with fresh ingredients are being scheduled for those first few days after we shop so they don't go bad and meals with frozen vegetables and non- perishable items are planned later. If an unexpected event pops up on a night we had a more elaborate meal planned I'll swap it for a night we were planning on a quick and easy meal. We try to make sure each week includes at least one quick meal like pasta and sauce or something else easily thrown together in case life pops up; as often happens. Now when I wake up in the morning I think about our day and look at the menu; taking out any meat or ingredients that need to thaw from being in the freezer. I can prepare casseroles or crock pot dishes in the morning while the boys are at the table working on their school books. It's nice to have one less thing to worry about each day and it sure has streamlined our grocery shopping trips! Thanks! It has cut down on so much of the complaining that I really wish we had started doing it so much sooner. You meal plan much like I do. I make a list of several meals, asking for any special requests, and shop for those meals. Then I have about a week's worth of meals to cook. I pick and choose based on my appetite or how much time we have to cook each day. Keep things simple! I also let my daughter cook a few times a week. The two things that have helped me the most with meal planning are keeping my pantry/freezer stocked with 'the essentials', and planning our meals somewhat around what's on sale at the grocery. Most weeks, I'm shopping more to replenish my stash and getting a few ingredients for whatever I've planned. And stocking up on whatever is on sale. I usually mentally go through what meat is in the freezer when I'm doing meal planning and go from there. I try to plan meals with what I have on hand but with the boys making suggestions I try not to stick to that 100% of the time. We definitely shop sales though and compare prices everywhere we go. I always make a menu and grocery list several days before Monday, my shopping day. It keeps me sane. I just need to learn to simplify my meals better I think. I'm learning! I'm trying to simplify our meals more and more too. I'd like to try and incorporate more meatless meals and sandwich nights but we're getting there. Meal planning has so many benefits at every stage of life. As my husband and I have begun our retirement, our meal planning has changed significantly...but is still a very important part of our lives. Thanks for sharing this. Very true. I'm glad we're getting into this habit; so many people I know don't bother with meal planning. Very true; though I am awful about planning meals for myself when my husband is out town. I just tend to make due with whatever I can find around the house.